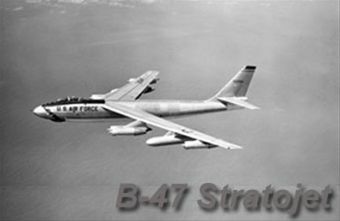 The aircraft and crew had been one of a three plane cell standing "Reflex Action" nuclear ground alert at Loring AFB. It had been downloaded the previous day, after being relieved by another aircraft/crew and was scheduled to depart for Pinecastle AFB at 0900. On board personnel included the 3 man crew and the aircraft Crew Chief. During the take-off roll, the Number 6 engine failed for reasons unknown. The bomber became airborne about 8000 feet into the roll, but quickly entered a descending right bank. It impacted in a wooded drainage ditch about 500 feet to the right of the runway, disintegrating in a fireball. Killed in this accident were: Captain Robert Schaffer, Pilot; 1Lt Melvin Shira, Copilot; Captain Robert McDermott, Navigator; and TSgt Samuel Harwell, Crew Chief. According to the Accident Report, the right wing made initial contact with this small hill. No wreckage could be found between here and the main impact point. In 1958, the tree line was near the right of this photo. Another 500' was later cleared to and a Conventional Enhanced Release Training (CERT) bombing range was added in this area. One of the two CERT scoring towers later erected adjacent to the crash site in the late 1960s. The drainage ditch where the aircraft nose impacted. The point of impact was flooded behind a beaver dam at the time of my survey trips (3) to this site. Wreckage is still present around the point of impact. Peggy Noddin with a section of stringer embedded in the ground. A constant speed drive/alternator from Number 1 or 6 engine. Sections of skin in the drainage ditch bank. Access panel with electrical connections and hinge pins. A section of the Navigator's Radar Control Panel. More pieces of wreckage from the crew compartment. Two views of the largest section of fuselage found. I believe that this is from inside one of the landing gear bays. More skin debris at the main impact site. One of the outrigger landing gear tires embedded in the ground a hundred yards from the impact point. A piece of fuselage skin over 200 yards from the impact point. It has an access panel and cannon plug. Note the fire damage on the outside surfaces. Another piece of fuselage or wing skin found along the treeline 500 feet from the main impact site. It has tubing and a Boeing part number on it. A section of piano hinged access panel from a lower aircraft surface (white anti-flash paint) with a 15 prefix Boeing part number and inspection stamp on the inside. An electrical component panel about 200 yards from the impact point. Labels indicate that it is the Voltage Regulator and Control Panel for the Left Alternator (Mounted on No. 1 engine). Manufacturer's spec plate for the Left Alternator Voltage Regulator. One of the main landing gear about 200 yards from the impact point. A section of fuselage structure from a main landing gear bay. A close up of an attachment point for the landing gear mechanism. Close up showing electrical cannon plugs and wiring. A very rare find at a crash site. This is a coil of high frequency chaff. During this era, it would have been used against interceptor aircraft short wavelength radars. In later years, it would have been employed against SAM and AA gun radars. More chaff scattered amongst the ground foliage.